Although the University of Vermont is a central part of the state economy, it operates in a national market. It competes for students, faculty, research monies and the like with colleges and universities throughout the country and this is apparent when one considers that it receives applications from around 22,000 out-of-staters annually. Indeed, only 31% of last year’s first year class (the most recent data available) were in-state residents. Similarly, Professors are recruited from graduate programs throughout the country and the world. The faculty in the Department of Sociology, for example, hail from a broad array of extremely prestigious schools including Princeton, The University of Chicago, The University of California at Berkeley, New York University, and the University of Wisconsin. A quick glance at newcomers to the BU in Fall 2017 includes scholars with PhDs from Stanford, McGill, and more. This national market is why UVM’s administration monitors faculty salaries at its competitors, publishing an annual list of compensation at institutions with which it vies directly for students and faculty. This is included in The UVM Sourcebook, the institution’s official reference guide to numbers and trends of finances and scope (See Table 1 below). 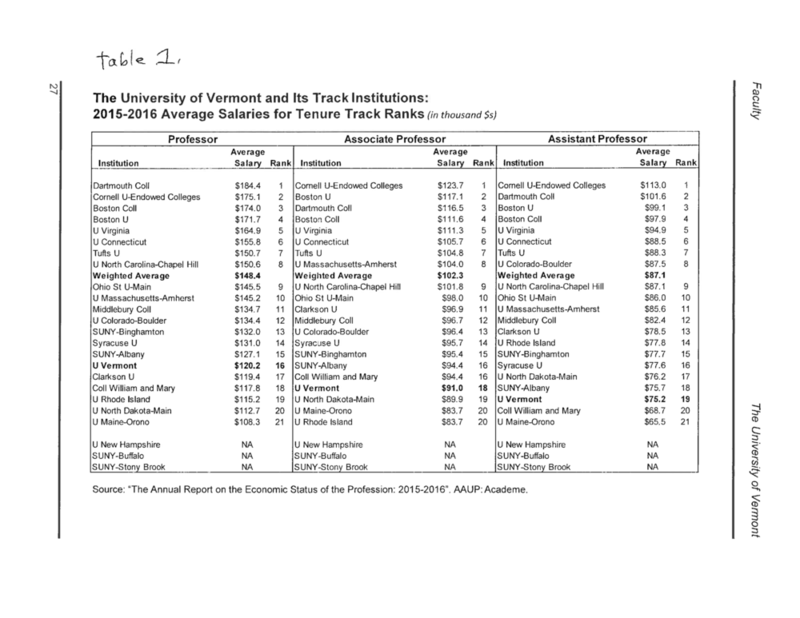 As the Table demonstrates, UVM’s faculty salaries compare poorly with its track institutions. Of the 21 schools included by UVM’s administration in the list, we rank 16 in salary for Professors, 18 for Associate Professors, and 19 for Assistant Professors. Thus, in the comparison drawn year after year by the UVM administration, faculty salaries clearly fall short. Of course, no serious analysis of the place of UVM’s wage structure can rely on a single point of comparison. The broad picture across databases is that, in no small part thanks to the formation of United Academics in 2001, UVM average faculty salaries rose from where they had fallen to in the previous decade -- the bottom quintile of public research universities — to somewhere closer to the middle. But in the last few years, things have started to slip downwards again. The UVM Sourcebook also lists information on faculty salaries by college. Drawing on data collected by Oklahoma State University (OSU), it compares our averages with a group of 41 institutions from across the country (See Table 2). This document does not include overall average salaries but, broken out by ranks and colleges, it does show that in comparison to OSU averages overall, UVM faculty at the rank of Professor are all to various degrees below average, Associates in four of the seven colleges are below average, and Assistants are below average in all but one college. At the bargaining table, our administration reported that we earn 104% of the OSU average. We have two problems with this contrast. First, United Academics finds this group of institutions very peculiar as comparators, different from UVM in fundamental ways. Second, we are at a loss for understanding how the 104% is calculated. Table 3 lists the schools included in the OSU sample. Note that few are in the northeast, our primary catchment area for students; fewer still are direct competitors for faculty, and most are fundamentally different in terms of institutional stature. The table includes U.S. News and World Report rankings for each school in the OSU salary data set, a prestige classification system taken very seriously by higher education administrators and most students choosing their colleges. It is clear that UVM does not fit well within the larger group; it is among the most prestigious schools included in the OSU sample. Indeed, over half of the institutions listed are more than 100 places below UVM in national rank, and not one of our official track institutions is included in the compilation. 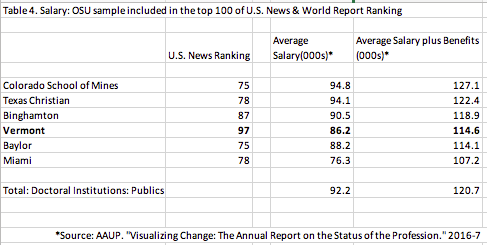 Moreover, when prestige is considered, UVM salaries do not fare well. Table 4 lists the average compensation of those OSU sample schools ranked in the top 100 by U.S. News and World report. In this group more closely approximating UVM’s standing among national schools, we rank five out of six in salary, and fourth of six when benefits are added. Considering institutions more comparable, then, UVM falls below, not above, average in compensation. In addition, to calculate their comparison between UVM and OSU salaries, our administration adjusted the OSU data in numerous ways. In its official document, it reports modifying for nine-month salaries, but they tell us that they needed additional adjustments to be consistent with UVM categories. Instead of trying to compare our compensation with a small group of oddly selected schools subject to unknown adjustments, we present compensation averages (Table 5) drawn from the highly respected annual salary survey of the American Association of University Professors, the same data source used for salary comparisons for our track institutions in the UVM Sourcebook. This survey includes every public doctoral institution in the country. As Table 5 demonstrates, faculty at the University of Vermont earn less than those at other schools in this category. Thus, reliable data on salaries suggest that UVM faculty compensation is below a majority of schools in our comparison group. Perhaps the best comparison, however, is between UVM and those schools to which we lose the most students. Table 6 lists the five institutions that our out-of-state admitted applicants -- our “bread and butter” -- attend most often, when they do not choose to come to UVM. Here we earn thousands of dollars less in salary and in, some cases, tens of thousands less when benefits are considered. Indeed, our salary averages about 83% of this group, rising to 83.7% when benefits are added. National data on annual raise pools are unavailable for this academic year, but we have been lagging behind AAUP averages over time. In our last contract (2014-2017), we averaged a three percent raise (backloaded) annually, in comparison to a front-loaded-total of 10.1% for the category. In the contract before that, our three-year raises totaled 4.9% (again backloaded), comparing quite unfavorably to the 9.5% gained nationally. Taken together, we are losing ground to our competitors and we are not keeping up with the national market in which we operate. The overall trajectory is one of gains early in the life of UA, with a subsequent flattening and decline more recently. Using the AAUP’s Doctoral 1 category, UVM’s average salaries rose from 84% of average in 2004, to 95% of average in 2011, and fell to 92% in 2016. In sum, then, the University of Vermont operates in a national market in which it competes for students, faculty and the like. If faculty compensation falls relative to that market, our ability to recruit and retain highly skilled and competitive professors declines and this impacts research grant totals, institutional prestige, standing in national rankings, student recruitment and resulting tuition income, and thus growth possibilities. The raise pool that we propose will do little to close the gap in faculty compensation, but we hope that it would contribute to stemming our loses. We are at a loss for understanding their calculation. Salaries reported in Table 2 demonstrate that the OSU averages are higher than UVM’s in 16 of the 21 categories considered. Moreover, in the few instances that UVM does report higher earnings, the categories include relatively few individuals. For example, although average compensation for associate and assistant professions in the business school at UVM is higher than at its OSU comparators, there are only 31 professors in the college (including underpaid full professors). On the other hand, there are 316 full-time faculty in the College of Arts and Science, and their average earnings are less than their OSU counterparts. In early contracts, when our collective bargaining agreement included market adjustments for those faculty below national averages, United Academics used OSU data to calculate compensation. We did this because the OSU data set was the only available source of department-level information. Now that we no longer need calculations on this level, we suggest returning to the best practice use of AAUP as the measure of relative compensation. Calculating faculty raises from reported salaries (unadjusted) in the OSU survey demonstrates an average increase of 3.2% between 2015-16 and 2016-2017 academic years.